Please note: I'm not anti-scarf because I think they're too girly or hipster or twee or anything like that. I'm just an overly warm-blooded guy, so wearing scarves tends to be out of the question unless I'm really, really cold. 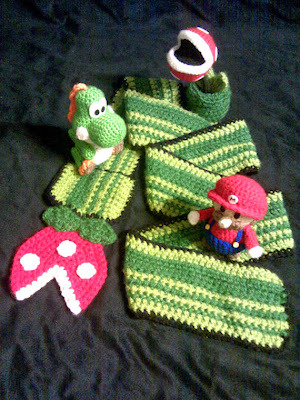 Anyway, like I suggested in the header above, I'd gladly throw those sentiments out the proverbial window if I owned a scarf that looked like one of the Piranha Plants from the Super Mario Bros. series. The scarf, which is five-and-a-half feet in length, was made by Flickr user Mindy Y (aka anenemyairship), by the way. See more of her creations--including an equally adorable Noby Noby Boy scarf and a crocheted baby Metroid--by checking out flickr.com/photos/enemyairship/. Thanks, Igor! As for whether or not I'm old: well, it depends on what you consider old. I'm officially 37 now, which I'm sure some folks will say is old and others will say is still young-ish. RE: MH3U--I'm not at all sure it'll be my kind of game either, but I want to try it all the same. Hopefully I'll like it at least somewhat! No problem. I hope your day was awesome! That is utterly adorable! I'm going to head over and check out more of her stuff! Ah, glad to hear you like it, Anne! I really wish she sold her stuff. Unless she does and I just didn't see an etsy link or something?